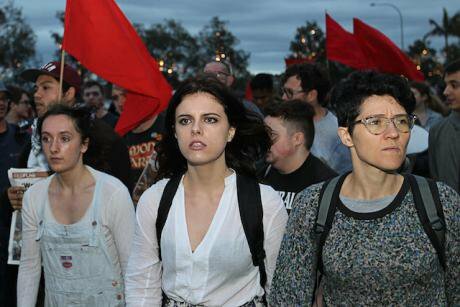 Protesters clash during a demonstration outside Milo Yiannopoulos' sold out show at the Melbourne Pavilion in Melbourne, Monday, December 4, 2017. Erik Anderson/ Press Association. All rights reserved. Can a non-ideological right exist? Is there such a thing as rebellious conservativism? Can being a member of a sexual minority be used as a shield to hold in front of you when you attack the forts of (supposedly) traditional left/liberal political correctness? These are the questions we should ask in relation to the quasi-invitation of Milo Yiannopoulos, a celebrated star of the Trump (online) subculture and a figure almost completely unknown in Hungary, to a conference organized by the Hungarian government. Typically, in the current reality of Hungarian politics however, we tend to respond to such crisis identities and crisis-political products of (post-)modernism as those of Milo by hysterically stigmatizing the phenomenon as far-rightism. To quote the dialogue of Péter Nádas and Richard Swartz: "Verdicts appearing in the clothing of finality are valid for one day only (...). They are final verdicts based on the prejudices derived from contemporary taste." Let us examine why Milo should be considered more than just a "far right" provocateur, and why he may instead be a product of the crisis of postmodern politics. Starting his career as a tech journalist and gaining dubious fame for his extreme acts and statements, and actually becoming a real opinion shaper as communication between such individuals and the public became increasingly privatized, Milo reduced public political discourse to the language of social media, thus becoming the face of an "alt-right" that concurrently denies the validity of ideologies, is anti-elite and xenophobic as well as heavily reliant on the fear of postmodern identity-driven politics. He is the face of a right the political essence of which may perhaps be most validly described as ‘troll politics’. Earlier on, a significant part of Milo's activities was that he went to anti-Trump rallies with his camera during the presidential election campaign, and while the participants of these events were demonstrating for peace, solidarity, and compassion under the flag of a tolerant America, they often reacted arrogantly and violently in Milo's videos. This was the way the Trumpist online network was able to "deconstruct" the self-image of Democrat supporters. Shared at an exponential rate within minutes, these videos, albeit aired with less significant viewership compared to the total American population, managed to reach where they needed to (and even farther), via the new online marketing tools. So the point of these actions was to quickly and widely "deconstruct" or undermine the image that the democrats attempted to convey about themselves. Recording the scene with his mobile phone, Milo accosted democratic protesters who gradually lost their "political temper" to the point when one particular demonstrator began to pound Yiannopoulos with a "Peace" sign, while Milo was broadcasting the whole thing live on Facebook, thanks to Mark Zuckerberg. This kind of "systematic upsetting" could not have worked so well in the time of the slow-response print media. The camera crews of major networks were sometimes unable to cover demonstrations in the era before online media dominance but the appearance and widespread use of (smart) phones has even rendered them unnecessary. Due to the new technology, opinion narration is privatized and the impact of the New York Times opinion column is less significant in the era of visual images (used as [counter-]evidence). We are stepping from one media bubble to another, finding ourselves in the narrative quarantines of meta-realities of whose real or supposed impact we don't really have any idea. Politicians, experts, and observers commonly speculate on how to win the “popularity contest” of politics, how to win the hearts and minds of their popular media-using constituencies. However, this speculative process has detached itself from the real trends of public opinion formation – and it has betrayed the “fundamentals” of the political field just as has been the case with financial bubbles and the real economy." So mediatized democracy struggles with structural feedback and responsivity defects, which then exaggerate the perception of events, individuals and scandals, and the "impact" of which is further intensified by the reactions of a critical public. 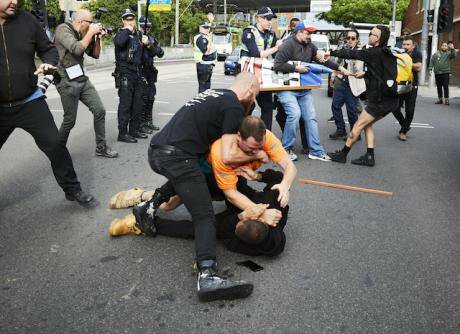 Supporters of British alt-right commentator Milo Yiannopoulos clash with left-wing protesters in Lilyfield, Sydney, Tuesday, December 5, 2017. Danny Casey. Press Association. All rights reserved. On the other hand, if you really look into it, the aura of this product of political crisis is not very far-removed from the political technology of contemporary leaders considered as right-wing populists. The primary goal of this political activity is not to promote the common good but to maintain a grip on power by occupying and monopolizing certain sectors (media, entertainment, etc.) and transferring them into the hands of the business elite collaborating with the holders of power, so that the thus "captured" state can manipulate the public through soft censorship. In the context of "official politics", the Milos of the world are trolls. However, they don't care whether their statements correspond to the reality or the experience they identify reality with. Ignoring debates, they cause scandal and create chaos to force their way into the political discourse, click by click. They no longer want to defeat or surpass postmodern intellectual narratives. Instead, they want to make them their own, turn them upside down so that they could eventually hold them up to the progressive elite as a mocking glass. Ultimately, this ideology-deprived politics aims to sell itself as the natural addiction of the "people" and the amplifier of the voice of those at the bottom – which also sounds all too familiar in Hungary. 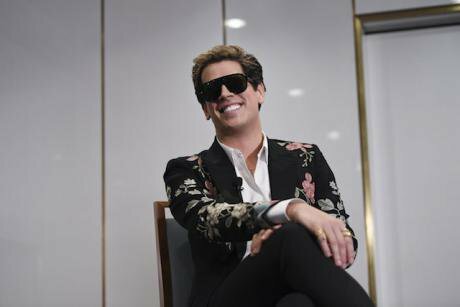 British alt-right commentator Milo Yiannopoulos speaks during an event at Parliament House in Canberra, Tuesday, December 5, 2017. Lukas Coch/ Press Association. All rights reserved. Does Milo Yiannopoulos take himself seriously? He doesn't need to. Do Orbán's people take him seriously? They may, but probably just as much as they have realized that postmodern liberalism must be defeated using postmodernism as the "means", by creating chaos, upsetting or even ridiculing values and throwing around ideological inconsistencies.